Which Tennis Court Surface Is Right for You? If you are just getting started competing against other tennis players, you may have noticed that different court surfaces often produce different results. 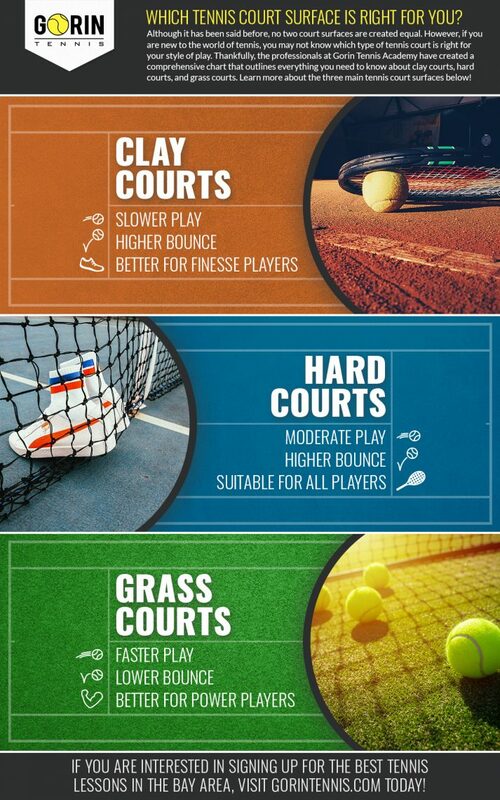 From sprawling grass courts to fast hard courts, every court surface offers its own unique set of characteristics that must be adhered to in order to experience success over your competition. However, as a newcomer, determining which unique traits each court type possesses can sometimes be difficult, leading to frustration on your behalf. That’s why, in today’s article, we will be talking more about how you can effectively manage every court surface while playing against the fiercest competitors so that you may emerge victoriously. 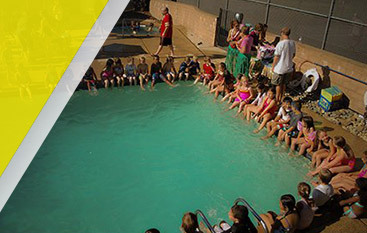 At Gorin Tennis Academy, we are the best tennis academy in the Bay Area, as well as the surrounding areas of California. As a certified member of the Global Professional Tennis Coach Association, we impart the latest knowledge and techniques onto our students so that they can develop their tennis skills and fundamentals with ease. With a number of tennis camps and tennis lessons to choose from, we know that you will be able to find the right classes to suit your needs. 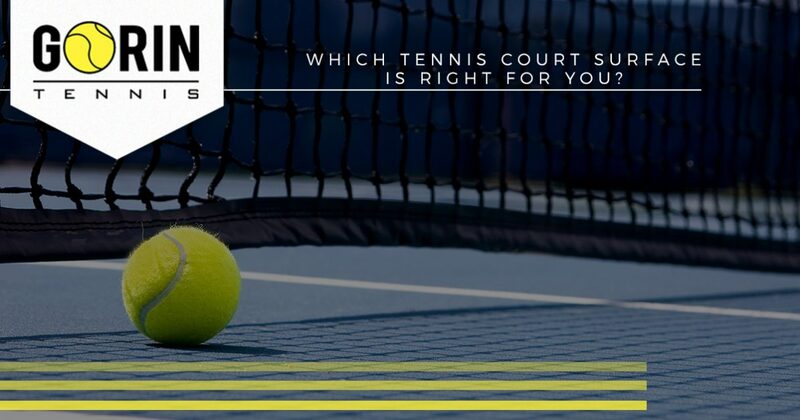 To learn about some of the many different court types that you will experience while embarking on your tennis endeavors, continue reading more below. While not as popular as hard courts, clay courts are much more predominant than grass tennis courts. When compared to hard courts, however, clay tennis courts feature a much slower pace of play thanks to this loosely packed material. For this reason, if you are a tennis player that typically relies on power to overwhelm your competitors, you may want to consider changing your style of play when competing on a clay court. These types of courts are ideal for players that show finesse in their game while operating primarily from the baseline. 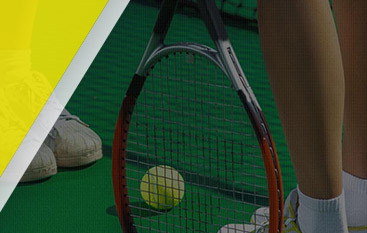 One of the most common types of tennis courts found amongst both amateurs and professionals are hard courts. These types of tennis courts are made from asphalt or concrete, and are both cost effective and easy to maintain. However, hard courts play at a much faster pace, and players typically experience a higher bounce than they would on grass courts. This is one of the reasons why power players fare so well on hardcourts, but finesse players are also welcome, as quick shots with deceptive spin can be difficult to return. Grass courts are synonymous with Wimbledon, one of the most prestigious tournaments around the globe. Similarly to hard courts, grass courts offer a faster rate of play but a much lower bounce. Power players tend to do well on grass courts, as faster shots with a lower bounce can be incredibly difficult to return. These are just a few of the ways that different tennis court surfaces can affect your style of play. It is always best to be adaptable while on the court, so that you are never faced with a challenge that you are unable to handle. 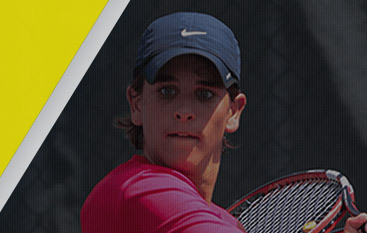 If you are interested in refining your tennis abilities with trained professionals in the Bay Area, look no further than Gorin Tennis Academy. We have helped countless students reach the next level of play, and we are ready to help you too. Call us today to get started!